The best time to drink juice is on an empty stomach, about 30 minutes before eating a meal. This allows for maximum absorption of the vitamins and nutrients. Try to consume juice within the first part of your day, as the complex carbs fuel energy. If you choose to drink later in the afternoon or evening, it is recommended that you select a juice that doesn’t contain a high amount of natural sugars (skip the oranges, apples and other fruits high in sugar). When most people think of juice, the sweet flavor of fruit immediately comes to mind. Not only is fruit delicious, but it is loaded with vitamins and minerals. Any of these powerful players will leave your skin smiling too! Lemon - Try to add lemon to as many recipes as possible, as the superfood not only aids in detoxifying the body, but also allows nutrients to be absorbed into the system up to 5 times as fast. Kiwi - Surprisingly, kiwi is packed with more Vitamin C than an orange. This little powerhouse is incredibly rich in nutrients, antioxidants, and potassium, which are all necessary agents in detoxifying the system, regenerating damaged tissue and collagen, and protecting the skin from harmful free radicals. If you are new to juicing, the idea of drinking the juice of a vegetable may sound unappealing at first, but don’t worry! The extractions of veggies add a crisp and refreshing burst of flavor to any juice, and are easily overpowered by the sweetness of fruit. Here are just a few that go a long way in achieving your goal of clear skin. Carrots - Surprisingly sweet, carrots serve as a base for many juice recipes. They pack a real punch with a hefty dose of beta carotene, calcium and potassium, as well as vitamins A, B, C, D, E and K, all great for maintaining healthy hair, skin, nails, and liver function. Kale - Often the “green” in “green juice,” this powerful produce is rich in Omega-3, calcium, anti-inflammatory nutrients, and free radical-fighting antioxidants, an important agent in maintaining healthy skin. Cucumber - The calming juice of cucumber is rich in potassium and Vitamin A, an important building block in maintaining a healthy immune system, skin tissue, and the growth of healthy skin cells. Parsley - The abundance of Vitamins A and C found in this helpful herb help treat blemishes and even out skin tone. Vitamin K promotes the skin’s elasticity, and is a great remedy in alleviating dry, flaky skin, which can lead to clogged pores. Cilantro - Also known as Chinese or Mexican parsley, cilantro contains beta carotene, Vitamin C and E. It is also high in chlorophyll, which fights acidity in the body and promotes cleansing and healing. This fresh herb helps control blood sugar levels, fight free radicals and has anti-inflammatory and anti-microbial properties. While juicing has many benefits, always be aware of going overboard with fruits, as the fiber has been removed in the juicing process, which increases the absorption of fructose by the liver and can result in major spikes to insulin levels. Even if you are supplementing your diet with juice to get your daily allotment of vitamins and nutrients, it’s important to keep eating fruits and vegetables, as you miss out on the important fiber needed to maintain a healthy digestive system once the juice is extracted. One way to utilize the leftover fiber is to add pulp to muffin or pancake batter, or use it to create a broth for soup or rice dishes. Also note, some juicers minimize the nutrients that are removed during the juicing process so do your research first to see which one will work best for your needs. Here’s a simple recipe to try at home! *For an added kick to any juice recipe, play around with adding ginger or garlic, both known for their antibacterial properties. 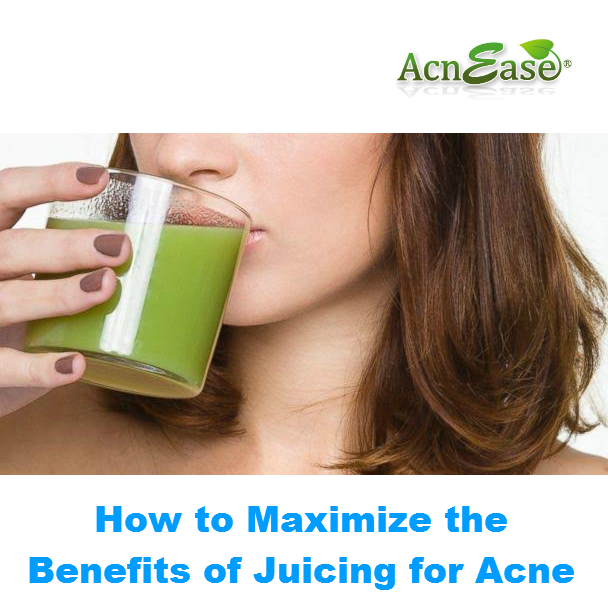 Juicing is not a treatment for acne, but a healthy step in cleansing the system from the inside out. 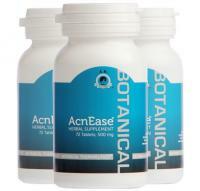 Just as the idea behind this targets the problem of acne at its source, AcnEase® abides by that very philosophy. AcnEase® is an all-natural, herbal acne treatment that stops acne before it starts by counteracting the effects of hormonal imbalance and the overproduction of sebum. Much like the organic fruits one would use to make a delicious juice, AcnEase® is an all botanical ingredient-based formula, so you don’t have to worry about any side effects due to harsh chemicals. All herbs used in the making of AcnEase® are of the highest quality, and have been extensively tested and proven safe in clinical trials. We want to hear from you! What are some of your favorite juice recipes? Do you have any fruits and veggies that you prefer that you didn’t see listed in this article? Tell us in the comments below!